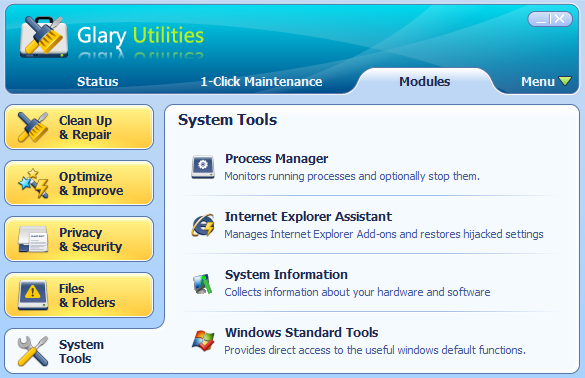 Glary Utilities is a powerful software package that consists of various utilities that increase your PC performance and maintain your system. It is embedded with powerful tools which manage your system and finally improves the performance of your computer. It has a nicely done user friendly interface which clearly shows all its features. You just need to select the features and the program will perform a quick scan for you. It will detect the problems and highlight them under each particular feature. After that you need to repair those problems by just clicking on to repair button and glary utility will do all the repair to your system at no cost. One thing that you should keep in mind is that, keep the back up of the important data before repairing the problems and when glary utility is working, the other processes may get a bit slow for that time. It is one of the best free software of its kind. Features like new restoration are added for shortcut fixer and empty folder finder. 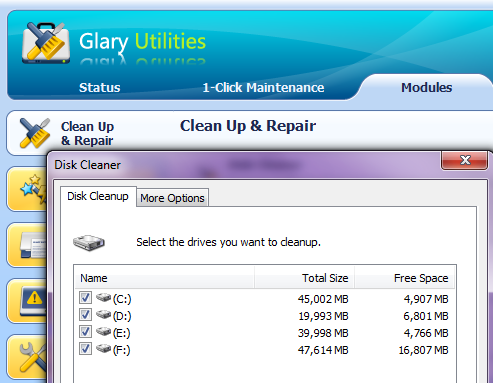 Disk cleaner is a program that removes unwanted junk data from system disk which generally gets piled up with regular use of computer and recovers disk space where as disk analyzer shows you the disk space usage of you files and folders, so that you can select only relevant data to keep into your system. Registry is a kind of repository in which unwanted data gets stored. Registry Cleaner is a part of cleanup and repair which scans and cleans up your registry to improve your system’s performance. Shortcuts Fixer helps you in correcting the errors in your startmenu and desktop shortcuts. Uninstall manager uninstall the programs completely which you don’t need any more for the better system speed. 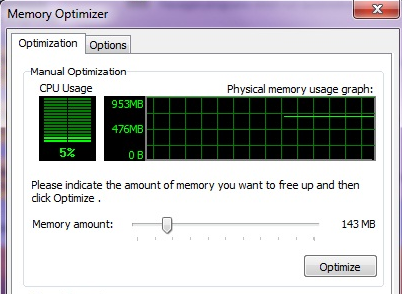 As the name defines, Memory Optimizer monitors and optimizes free memory in the background. You can check from the screen shot that how you can manually select the amount of memory that you want free and then optimize it. 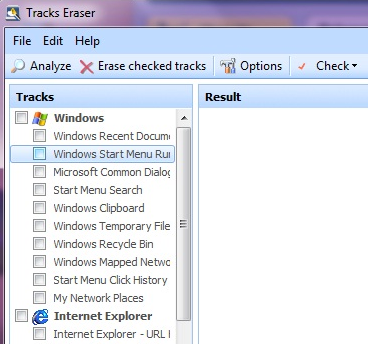 Tracks Eraser erases all the traces, evidences, cookies, internet history and much more where as File Shredder is for erasing files permanently so that no one can recover them. It removes all your personal data in order to maintain your privacy. Startup Manager manages programs which run automatically on startup and Context Menu Manager manages the context-menu entries for files, folders etc. File Undelete will quickly retrieve accidentally deleted files from your system. 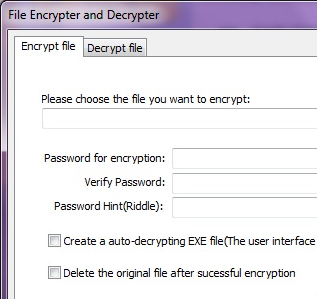 File Encrypter and Decrypter protects your file from unauthorized access and use. Duplicate Files Finder can search for space-wasting and error producing duplicate files and Empty Folders Finder can find and remove empty folders in your windows. Process Manager manages a running process on the computer i.e it monitors the performance of running process and optionally stop them if it senses anything suspicious. Internet Explorer Assistant manages Internet Explorer Add-ons, using the ‘Internet Explorer Assistant’ you can easily disable, enable and delete any of the “add-ons” in order to keep your IE browser as stable and efficient as possible.